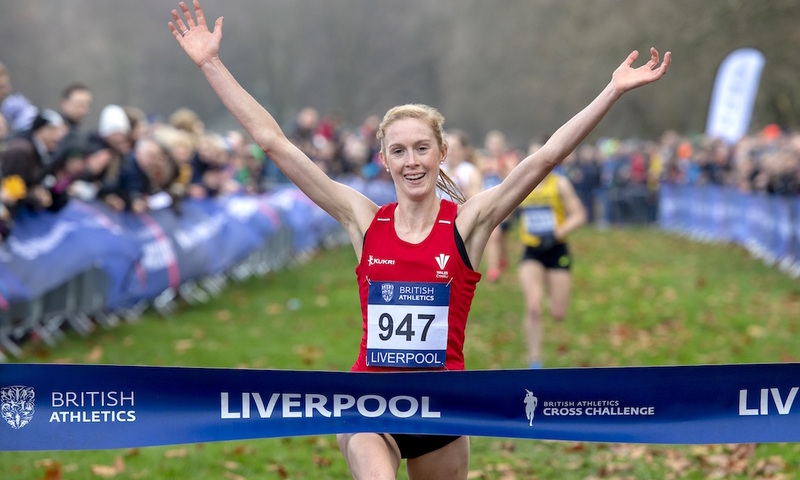 Charlotte Arter (coach: Chris Jones; club: Cardiff AC) and Ross Millington (Steve Vernon; Stockport Harriers) were among 26 athletes who automatic selection for the British Athletics team for next month’s European Cross Country Championships as they took hard fought victories in Liverpool. An incredibly close senior women’s race saw Jess Piasecki (Robert Hawkins; Stockport Harriers) and Verity Ockenden (Tony Houchin; Swansea) battling with Arter throughout as the lead changed hands several times, but the latter kicked when it mattered, taking first place in 26:10. Ockenden and Piasecki crossed the line together in 26:14 to secure their automatic spots on the team, with Melissa Courtney (Rob Denmark; Poole AC) following them home in fourth in 26:18. After missing out on the British team in 2017 through injury, Arter is ready to showcase what she can do on the international stage once again in Tilburg next month. She said: “It was a really quick race out there and I just had to try and stay with the leading group and I knew all the work would be done on the last lap. I thought Jess [Piasecki] would go earlier, then she came back on my shoulder and gave it my all in the final turn. “I missed last year’s Euro Cross because I had an Achilles injury and I wasn’t in shape but I made the team in 2016 and it’s a real joy to be back in the British team and earn another British vest. “It means everything given I had an injury prior to the European Championships in Berlin and I’m really happy to finish 2018 on a high by making the European Cross team. I love it and I’m excited to see what I can do in two weeks. Millington, a course winner in Liverpool back in 2015, was part of a five-strong leading pack that pulled clear early on, before moving swiftly through the gears and showing great speed in the closing stages to stop the clock in 28:00 and claim his second win in Liverpool. The Stockport athlete was chased home all the way by Nick Goolab (Craig Winrow; Belgrave), who required a sprint finish to hold off Marc Scott (Jerry Schumacher; Richmond & Zetland) and Charlie Hulson (Steve Vernon; Liverpool). The trio, who were split by just two seconds, recording 28:04, 28:05 and 28:06 respectively to take the remaining three automatic qualification spots, with Dewi Griffiths (Kevin Evans; Swansea) coming home just three seconds further back in fifth. 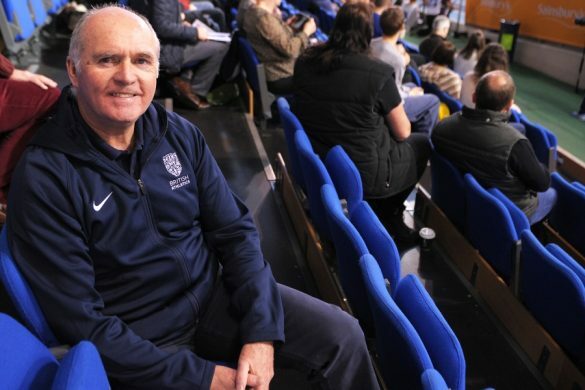 After missing last year’s championships, Millington is delighted to be back in a British vest and hopes he can show the form he produced in Liverpool in The Netherlands in a fortnight. “It felt quite different to previous years, normally the group gets away quite quick and when I looked around there was always a load of guys there. I kept looking for Dewi [Griffiths] because he likes to press from the front and I was waiting for that. “Marc hit the front and I thought I’d go when he went, then it slowed again but after a bit of a rough spot, I got the momentum and pushed it on. I really wanted to win here because I’ve had a few really tough years and I wanted it really badly, especially against such a good field. “It’s been the goal since the summer to make this team and hopefully in two weeks I’ll be ready to roll. 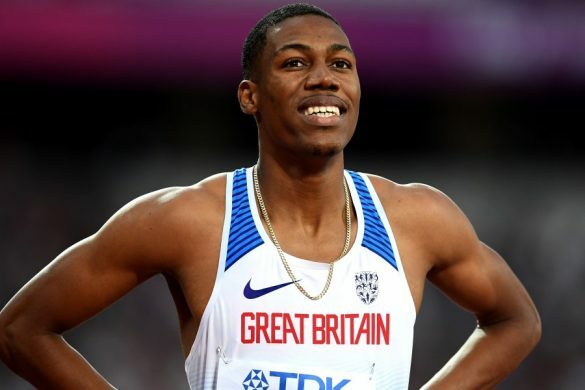 This has been the biggest high point for a while because of the injuries I’ve had but I’m really excited to be back in a British vest,” he added. The Under-23 places on the British team, which were contested within the senior races, saw Amy Griffiths (Rob Denmark; AFD) as the first woman home in 26:48 for eighth place overall, with Poppy Tank (Simon Anderson; City of Plymouth) securing herself a British vest, clocking 27:18. Dani Chattenton (Kyle Bennett; MK Distance Project) took third place within the age-group in 27:33, good enough for 25th overall, while the final automatic qualification spot was taken by Abbie Donnelly (Rob Lewis; Lincoln Wellington), stopping the clock at 27:51. In the men’s equivalent, the top four athletes all followed each other home inside the top-10, with Emile Cairess (Philip Townsend; Leeds City AC) winning their battle in 28:23, taking a hard fought sixth place, a second ahead of series leader Mahamed Mahamed (Peter Haynes; Southampton), who secures himself another British vest. Paulos Surafel (Craig Winrow; Thames Valley) was three seconds further back in 28:27, with the resurgent Oliver Fox (Richard Lewellyn Eaton; Wells City) ensured himself an automatic qualifying spot, finishing ninth overall in 28:29. A hotly contested women’s U20 race saw last year’s European Cross team gold medallists Cari Hughes (Andy Walling; Swansea) and Amelia Quirk (Mick Woods; Bracknell AC) battle all the way, but Hughes timed her charge to perfection and took her first victory of the Cross Challenge season and her place on the British U20 team in 14:41. Khy Mhlanga (Mick Judd; Herts Phoenix), who remains top of the series standings, powered into third place in 14:45 to retain her place atop the standings, with Grace Brock (Cornwall AC) and Forres’ Anna MacFadyen taking the final automatic places, coming home fourth and fifth respectively. The men’s U20 race saw Jake Heyward take his second series win with a dominant performance, pulling away with 800m to run to stop the clock in 19:41, well clear of NCAA Athlete Isaac Akers (Bill Boyd; Corby), who finished 12 seconds further back. Tom Mortimer (Christopher Brown; Stroud) came home third in 20:00, holding off a determined Matt Willis (Wrexham) with the last automatic place taken up by Jack Meijer (Barry Hearn; Marshall Milton Keynes), stopping the clock in 20:06. Away from action involving the British team, Hamish Armitt (Dudley Walker; Giffnock North) followed-up his second-place in Milton Keynes with victory in the men’s U17 race, winning in 17:20, comfortably clear of Nicholas Harhalakis (Cambridge & Coleridge), three seconds further back, with Archie Lowe (Martin Peevor; Middlesbrough AC) third. Charlotte Alexander’s (Wayne Vinton; Herne Hill Harriers) eighth in the combined U17/U20 race earned her a maximum points haul in the U17 class, but Shannon Flockhart (Robert Pocklington; Cambridge & Coleridge) moved top of the standings with a third place finish, the duo split by Cera Gemmell (Henry Muchamore; Team East Lothian). Lewis Sullivan (St Edmunds Pacers) led for long spells of the U15 Boys race, only for Woody Jerome (AFD) to time his charge to perfection and take victory from under his nose, clocking 9:32. Kyle Rabjohn (Richmond & Zetland) completed the podium and remains atop the Cross Challenge standings as he came home in third in 9:36. Beatrice Wood (Dave Amey; City of Salisbury) pulled out a dominant display to claim U15 Girls victory, her first win on the Cross Challenge circuit this season, in 10:25, with Anna Hedley (Fife AC) Holly Weedall (Andrew Carter; Vale Royal AC) taking second and third place respectively in 10:31 and 10:35. The U13 Boys race saw Isaac Morris (Mark Vile; Cambridge & Coleridge) and William Rabjohns (Poole AC) fight all the way to the line, with the aforementioned Cross Challenge series leader extending his lead by taking victory in 9:53, with Benjamin Peck (Thetford AC) continuing his strong form with a third-place finish. Isla Thoms (Fife AC) clocked 11:06 for victory in the U13 Girls race, pipping Isabelle Price (Wolverhampton & Bilston) by five seconds, who was a further five-seconds ahead of Sophie Dunbobbin (John Skevington; Wreake & Soar Valley) in third. Full results can be found under the Liverpool tab here.